As a few of you might have noticed - I failed yet again to post an awkward story yesterday. You see, I usually type my stories up on Monday. But in the light of yesterday's event, very few things seemed important to me yesterday except my family. 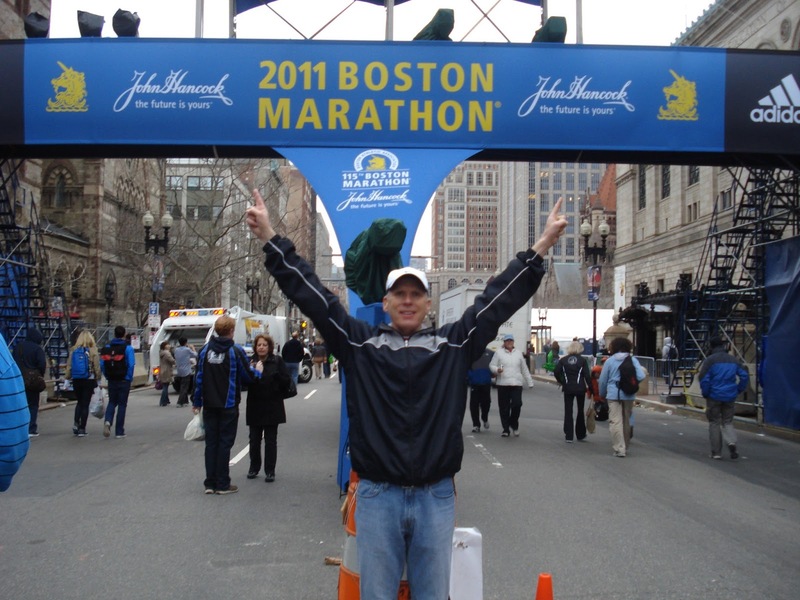 I had completely spaced my dad was running the Boston marathon until I called him the Friday before. "Hey, dad. I'm coming home for the day to visit some friends if you want to do something together." I said. "Okay, well, we're leaving for Boston today so we won't be there." I was incredibly excited for my dad, nonetheless. It was his 30th marathon and his 5th time running the Boston Marathon. I had no doubt he would rock it once again! 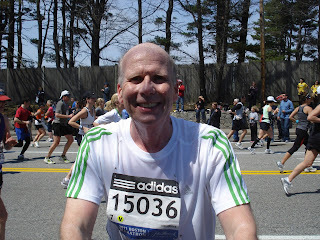 I had been receiving texts periodically throughout the day from the marathon updating me on my dad's pace. He had done the 10k while I was studying math. He had reached the halfway point during my geology class. And during lunch, as I cracked open my chocolate milk, he had finished! It took him 3 hours and 33 minutes. I was so excited for him, though I felt a little on the fat side seeing as I was drinking chocolate milk and my dad had just finished a marathon! 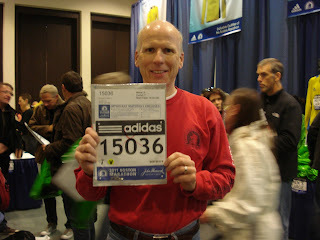 You're going to see some things about an explosion at the marathon. Don't worry - we're safe back at the hotel. "It was probably just a gas leak or something," I said to myself. But I couldn't stop my heart from pounding. Stop being stupid, Carmen. They said they were fine.I told myself. I got a text from my older sister who was still in town, saying how horrified she was. This isn't just a gas leak. My class got let out late. My thoughts were rushing. What on earth had happened? I had texted my sister asking her, but no response. I left my friend who usually walks to the parking lot with me and ran to the computer lab. I remember my heart was beating inside my chest. I had to know what was going on. "They're fine, Carmen. They're fine." I kept telling myself. I physically began to shake as I read the headlines. I could hear my heartbeat rush in my ears. It felt as if someone had just kicked me in the chest, and was now squeezing my neck. I couldn't breath. I read of lost limbs and bloody streets. I watched clips of the fiery explosion and people running, desperately crying for their loved ones. My eyes began to water and I willed the tears to go away. They're fine, Carmen. They're fine. I saw an interview of a man whose dad had been seriously injured in the explosion. He stared at the ground as they interviewed him, a blank look on his face. "My dad couldn't walk. They had to put him in a wheel chair." My dad couldn't walk . . . my dad couldn't walk. . . my dad couldn't walk . . . I walked almost in a daze as countless friends texted me to make sure my dad was okay. I answered a phone call and said hi to people and did my best to smile and seem calm. My family was fine. So I should be fine. But the feeling of my heart being squeezed wouldn't go away. I drove to my sisters work, and tried to get my mind off of things, and in the end I ended up thinking of nothing at all. I parked in the lot of my sisters work, and climbed out of the car. Before I knew it, I was flat out sprinting. I remember bumping into a girl who was holding hands with her boyfriend. How can they be so calm when something so terrible is going on? I threw the doors open and ran up the stairs to my sisters work, skipping steps. 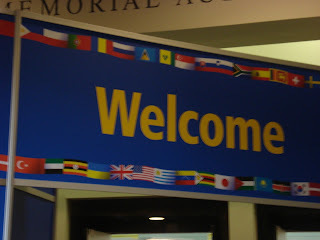 When I got there, I collapsed in a chair in the front lobby. But I could feel my calmness breaking and my emotions started to take over as I attempted to make small talk with her coworkers. I waited for my sister. My sister's coworker walked out and I heard her say the words, "Another one just went off." "A third one, at the library." . . .How many more are there? Are they still okay? How much longer is this going to go on? With shaking hands I picked up my cellphone and struggled to call my mom. I put in my dad's number. The same with my sister who was there, and her husband. My sister came out to the front, and her coworker said those same words. "There was a third one at the library." My sister covered her mouth and put her head down. I ran past her boss and her coworkers and hugged her as hard as I could. And all my composure was lost and I felt my face, my body and my emotions completely crumble. By now I had found out that the third bomb was actually an unrelated fire, and that they had cut off all cell phone service to prevent more possible explosions, but this hadn't helped me at all. I went back to that numb feeling. My dad was in Boston. My sister was there, and so was her husband. That left only me and my other sister together on safe soil. I hoped my niece and nephew were okay. Everything that had seemed stressful the night before seemed stupid now. Why do finals matter? Why does it matter that I'm lonely? Who cares what the weather is? The excitement and anticipation I had felt for my mission was gone in that moment. I wanted nothing more than to be in Boston with my family, and to know exactly what was going on. I had driven to fill up my car with gas. As I returned and walked back into my apartment, I couldn't help by stair at the T.V. All I had to go off of now was the media. What if there really was a third one by now? I did probably the dumbest thing possible, and turned on CNN. I saw clips of the explosion. People fell. Blood splattered the ground. I stood in that exact spot two years ago. The people I care most about are there. Over and over again I saw the explosion go off, and runners fall over, or look over their shoulder and go from running at a calm speed, to running for their lives. I recognized one of the buildings they showed police surrounding and people crying in front of. 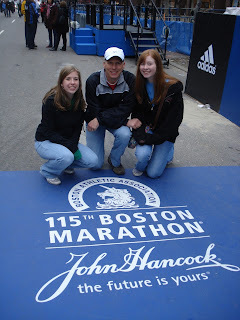 It was the hotel my family had stayed at two years earlier for the marathon. That could've been my family. And that's when I completely, totally, 100 percent lost any self control I had left. I clutched my stomach, so sure that I was going to throw up. Tears drenched my face as my roommate walked in. Seeing as I don't own water proof mascara, I'm pretty sure I looked awful. "What are you, stupid?!" she yelled, "TURN THAT OFF!" No better words could have been said to me. I flipped it to the Disney Channel. Yeah, not sure if that was really a better option. But she held me until I calmed down, which I was so grateful for. I still feel like I was overreacting, and some of you might think I was as well. My family was fine. But when you only get one message before your main, and really only, mode of communication was cut off, you hear about a third bomb, nearly all your family is in a terror zone, you're a natural when it comes to worrying and you only have the media to keep you updated as to what is going on . . . well crying seemed completely justified to me. Regardless as to whether or not your family is fine. I spent the rest of the evening at my sisters house, where we ate crazy bread, french fries, chicken nuggest, twix's, and switched between watching CNN and Legally Blonde. I have often been grateful that we live so close to each other, but not as much as I did at that moment. I felt numb again. I know I keep saying that, but I just kind of felt . . . emotionless inside. I wasn't upset anymore. I knew they were okay. But I wasn't happy either. I didn't want to talk to anyone, but I knew I had to. Shutting myself out would only make the situation worse. So I smiled. And I really did feel fine. My family had reached the Detroit airport by now and I called my dad. I had been kicking myself for the past two days for calling him a looser in the last conversation we had had. But that's what favorite daughters do, right? Hearing my dad's side of the story made the whole situation seem even more real. I'm rewriting this as best as I can remember him telling me. My parents meet around the same general area each year at the Boston marathon. This location isn't far from where the explosion happened. My parents were coming up with the plan for the next day, when my mom made a suggestion to move the usual location to a place farther away but more convenient. They decided to go for it. Monday, about 4 hours before the explosion. 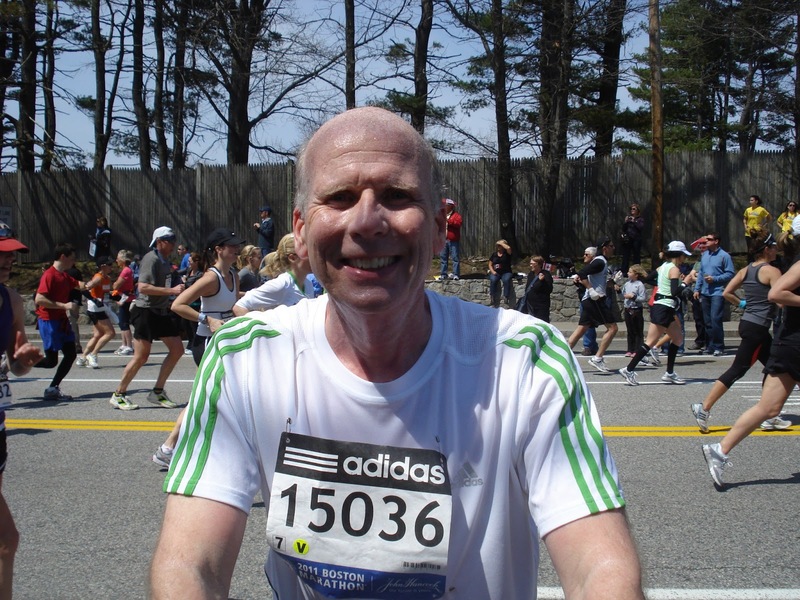 Every year at the Boston Marathon, my dad carry's a camera with him and pauses or stops to take pictures along the trail. This year, he found himself battling with whether or not to take the camera with him. He turned in his bag that he would pick up at the end of the race, and still had his camera with him. You take pictures every year. And besides, there's only 40% battery life left. My dad told himself. He asked for his bag back, and put the camera back inside. About 20-30 minutes before the explosion. The finish line was in sight. My dad was making great time, although I don't think he realized how good he was doing yet. Maybe I'll swing by to the left side and give everyone a high-five. My dad thought to himself. My dad says he didn't know why, and perhaps doesn't still know exactly why, but he felt so strongly that he should not go to the left side (the side where the explosion would occur just about 15-30 minutes later) to greet those people. He described it as a very dark feeling. And so he kept running. My dad crossed the finish line. 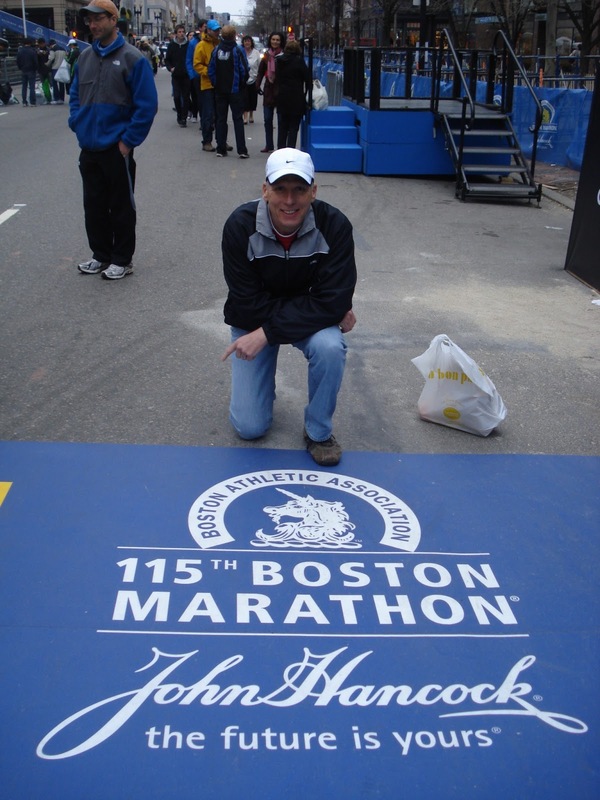 Next, my dad had paused to get his picture taken with the finish line in the background. We would realize the next day that the photographer, who was also a friend of ours, was standing very close to where the explosion took place. Personally I consider them both very lucky. My parents were walking back to their hotel, just about a half mile away/fifteen minute walk, from the finish line, when they heard and felt the rumbling. Assuming it was a celebration for Patriots day, they weren't worried, until they got to their hotel and realized what had just happened at the place where they were 10 minutes earlier. I can't help but think of What If's. What if my dad had taken the camera and paused to take pictures? Would that slow him down enough to be part of the explosion? What if my dad hadn't gotten as good of a qualifying time the year before and had to start the race later? What if he had gone and greeted people on the left side? What if my parents had kept their original meeting place? What if he hadn't run as fast? What if they had gone later to get that picture taken? What if they were injured? Where would my sister and I be? What if my sister and her husband had been hurt? Where would their kids be? My parents talked about the heightened security. Their hotel would check their key cards before the entered. The streets were empty except for the police and the few stragglers like my parents who had to venture out to get food. 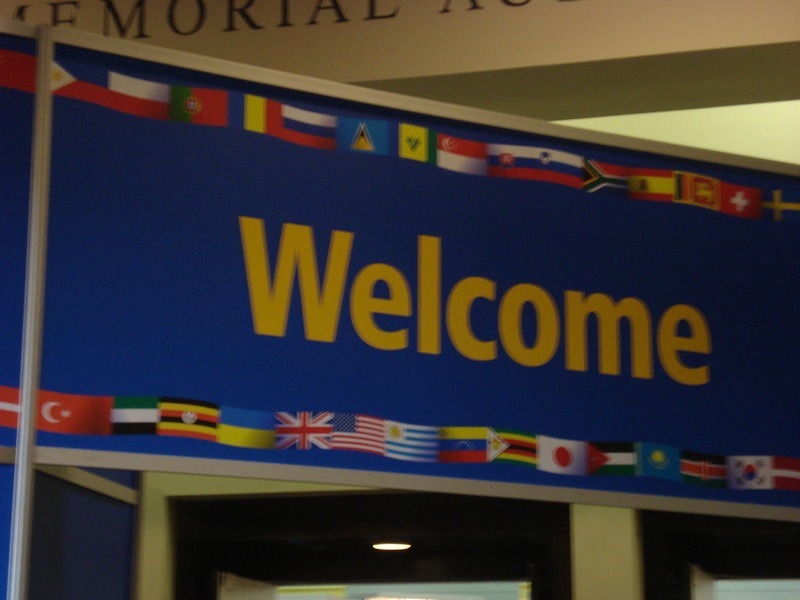 My dad said it was a melancholy feeling at the airport the next day. Runners usually asked each other how they did. This time they would ask if they even got to finish. Sometimes they would just nod at each other. My dad said he talked to a woman who was in between the two explosions. She didn't run for the finish but ran for her life instead. Part of me wonders if she was one of the people I saw on the news. I don't know who all will read this, or if anyone even will. Frankly I'm not even sure why I'm writing this. Maybe I just need to get it out there. I also really don't know how your feelings or opinions towards God are, and nor do I really care because I'm going to state mine anyway. I'm sure all of you know how much I love and believe in our Heavenly Father. The events that took place leading up to my dad and families safety only strengthened my belief in Heavenly Father, because I have no doubt he played a huge role in their safety. I also have no doubt that he is mindful and watchful of all the victims of this event and that he is comforting them as we speak. Part of me is grateful that I was impacted personally by this. It opened my eyes to 9-11, the Sandy Hook elementary shootings, and far too many other disasters that thousands of people were killed in. I often think of the people killed, or even the killers themselves, but not until now did I think this much of the families of the victims. This event, although it was horrible, could've been so much worse. I'm so grateful it wasn't. It opened my eyes to the little things in life, and made me grateful for so many blessings that I have. My family was definitely watched over. I love my family so much and am so grateful for their safety, and so grateful for those who checked up on me and put up with my melt downs during this whole fiasco. This opened my eyes to how loving our world can be. But at the same time, I never before have felt so disgusted with the world. 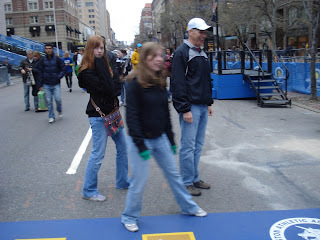 *these are from the 2011 Boston Marathon.